I met Brian and Nathan this morning in the parking lot of the Bellevue United Methodist Church building for a 6-mile loop that incorporated the Harpeth River Greenway. We were met with temps in the mid 60s and a steady rain. A run in the rain this morning was a welcome change from the soupy heat and humidity of the past two weeks. While it was obviously still humid, the rain was refreshing. My legs were very tired, but again they felt better than the same day last week, which is a positive. I can tell that my body is slowly adapting to the workload, but I still have a LONG way to go. The last two days of my running were better than last week, but they were still tough with the soupy humidity!! 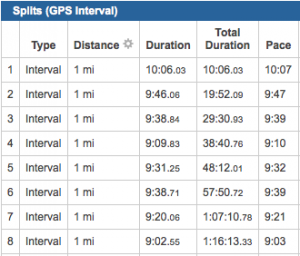 My legs are feeling stronger, and the gears don’t seem to be grinding as much at the beginning of my runs. On Saturday morning I met Brian in Percy Warner park for a hilly run through Percy and Edwin Warner. Even though both of us were wearing Garmins, for various reasons we lost track of how far we had gone so we just had to estimate when we reached the planned 6-miles. After getting back to the house I used mapmyrun.com and calculated our route to be 5.85-miles, which was a touch short. However, it was an enjoyable effort with Brian. My legs were very tired, but I thoroughly enjoyed the conversation during the run. 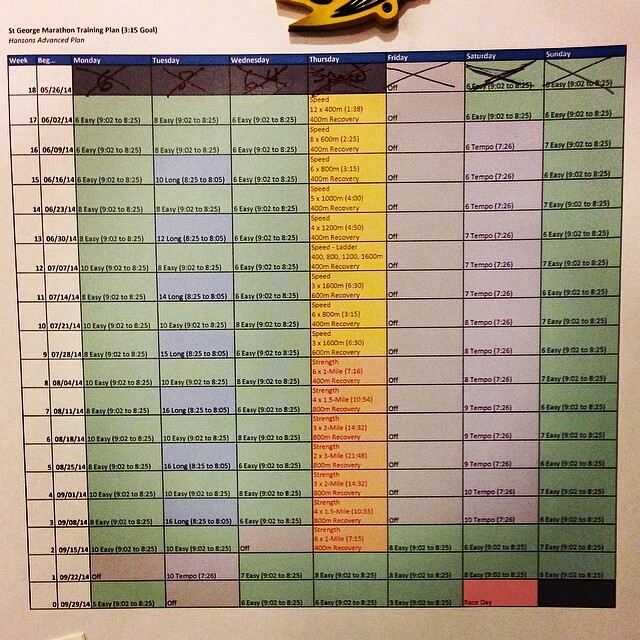 2 weeks down, 16 to go for my 2014 St. George Marathon training plan. I got in almost 33 years of practice doing “off-days” before I became a “runner” in 2007, so this “off-day” was a piece of cake. Ooooo…I like cake! Especially with chocolate icing. 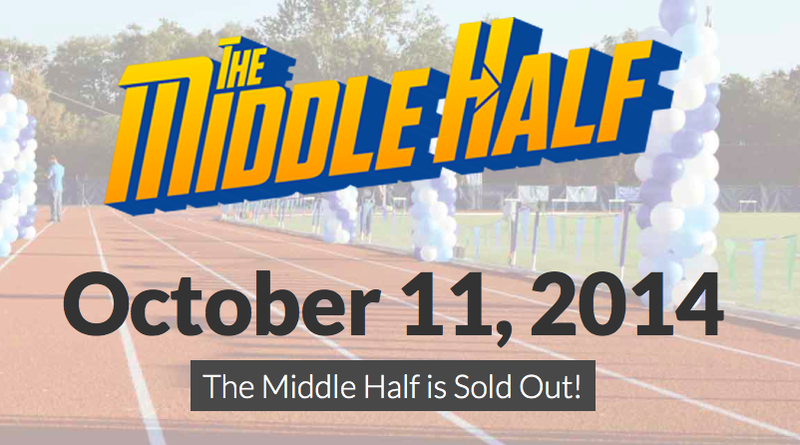 Wait….where was I….Oh yeah, today was an “off-day” from running, and it was good to get a break after 6-straight-days of scheduled runs, and a tough workout last night. My legs actually feel really good today. I remember last Friday that I was extremely sore after a hard track workout the night before. Today I’ve got a little soreness in my right hip-flexors, but otherwise am feeling better than I expected. Hope this holds true on my scheduled 6-miler tomorrow. STG Training – Week 2: A Gaggle of Geese with their Goslings / Count With Me! 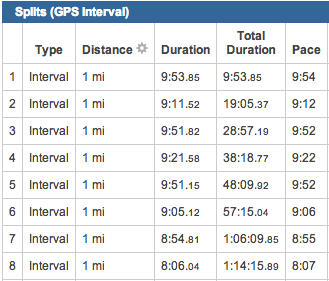 After a miserable run on Monday, yesterday’s run was significantly better. I’ve come to grips with the fact that I simply cannot hit the target paces from then Hansons plan when the humidity is at 95%. It’s funny that in the weeks leading up to the start of my scheduled training, when I was practicing the different pace ranges, that I was having trouble with being too fast! Of course, many of those mornings were in 50s or 60s with 60% humidity. It makes a BIG difference. One of the core principles of the Hansons Marathon Training Plan is “Cumulative Fatigue,” which essentially means that you are always running on tired legs until the week of your race. Well, it has only taken 6 runs for “Cumulative Fatigue” to take over! Today I had NOTHING! This morning I met Nathan and Brian at 5:30am for a jaunt on our old “Nature Center Loop” starting in Edwin Warner Park. I knew right away that my legs were dead, and they just seemed to get worse the longer we went. 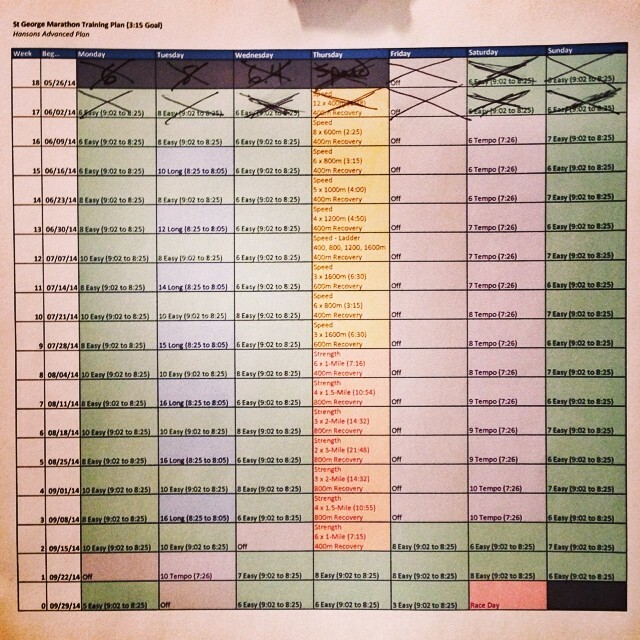 1 week down, 17 to go for my 2014 St. George Marathon training plan.